The Powerhouse Theater (officially the Hallie Flanagan Davis Powerhouse Theater)[a] is a theater building on the campus of Vassar College in the town of Poughkeepsie, New York, US. Originally built as a power station in 1912, it was renovated and repurposed as a theater in 1973. It hosts student productions as well as professional workshops and readings as part of the Vassar–New York Stage and Film Powerhouse Theater program each summer. Vassar College, the first degree-granting institution of higher education for women in the United States, was founded in 1861 in the town of Poughkeepsie, New York. The campus transitioned to electrical lights from gas lighting in 1912, which necessitated the construction of a power station. The building was designed by Lord & Co. and constructed adjacent to the school's Main Building, where it ran until 1954. Thereafter, the college began buying its power from a nearby utility company. The old power house was retrofitted as the Powerhouse Theater in 1973 by Chicago architect Robertson Ward Jr. A black box theater space, the Powerhouse was designed to allow the audience to occupy a third of the floor space, while the remaining two thirds were to be used as performance space. The building is officially named the Hallie Flanagan Davis Powerhouse Theater, in honor of Hallie Flanagan, founder of the Vassar Experimental Theater program. At the Powerhouse's opening in 1926, theater critic Brooks Atkinson spoke and several scenes from Flanagan's works were performed. After its renovation, the Powerhouse stood as the only significant construction among the nearby cluster of former service buildings, known collectively as the "backyard" until the 1990s, when the adjacent structures received their own renovations. 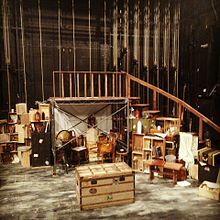 During the academic year, student-led productions presented by the Experimental Theater are presented in the Powerhouse. During the summer months, the theater plays host to an eight-week professional theater development program, named the Powerhouse Theater after the eponymous structure in which many of the program's readings and performances take place. A collaboration between Vassar College and New York Stage and Film (NYSAF), the program offers theatermakers room to workshop and develop works of film and theater. The NYSAF Powerhouse Theater program was founded in 1984 by Max Mayer, Leslie Urdang, and Mark Linn-Baker. By 2009, it offered an apprenticeship program and had an annual budget of $900,000. Tickets for works presented at the Powerhouse Theater program are open to anyone but reviews, except by local papers, are banned. Broadway shows first presented with the Powerhouse Theater program include 2016 Tony Award winners Hamilton and The Humans, and 2016 Tony award nominee Bright Star, which had won the 2016 Outer Critics Circle Award. ^ Some sources list the building's spelling of Theater as Theatre. ^ Dobbins, Mark (October 12, 1973). "Powerhouse Revived". The Miscellany News. Retrieved August 20, 2016. ^ a b Bruno & Daniels 2001, p. 118. ^ a b Daniels 1987, p. 71. ^ a b c Daniels 1996, p. 74. ^ Legner, Linda (December 1976). "Robertson Ward: Research is still part of design". Inland Architect: 15. ^ Van Lengen & Reilly 2004, p. 118. ^ "The Hallie Flanagan Davis Powerhouse Theater". Drama Department at Vassar College. Vassar College. Archived from the original on January 18, 2016. Retrieved August 20, 2016. ^ McGee, Celia (July 22, 2009). "On Campus, an Incubator for New Plays". The New York Times. Retrieved August 20, 2016. ^ "Hamilton". Tony Award Productions. Retrieved September 1, 2016. ^ "The Humans". Tony Award Productions. Retrieved September 1, 2016. ^ Gordon, David (May 9, 2016). "Cynthia Erivo, Danny Burstein, Steve Martin, and More Win 2016 Outer Critics Circle Awards". TheaterMania. Retrieved September 1, 2016. ^ Barry, John W. (June 13, 2016). "Vassar, Powerhouse Theater bask in glow of Tony Awards". Poughkeepsie Journal. Retrieved August 20, 2016. This page was last edited on 21 August 2018, at 03:49 (UTC).